WASHINGTON (AP) — President Barack Obama on Friday urged all sides in Turkey to support the democratically elected government of President Recep Tayyip Erdogan amid an attempted military takeover of the key NATO ally. In a statement issued after a meeting with his national security advisers, Obama also urged everyone in Turkey to show restraint and avoid violence or bloodshed. The state-run Anadolu Agency says a bomb has hit the Turkish parliament in Ankara. CNN-Turk television reported some police officers and parliament workers were hurt in the bomb attack. A resident living not far from the area told the AP he heard a massive explosion that shook buildings and saw a column of smoke but could not confirm if it was coming from parliament itself. The person, who spoke on condition of anonymity for security reasons, also said fighter jets were flying low in the area. 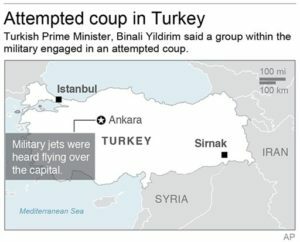 Members of Turkey’s armed forces declared hours earlier that they had taken control of the country as explosions, gunfire and a reported air battle between loyalist forces and supporters of the coup erupted in Ankara, the capital. 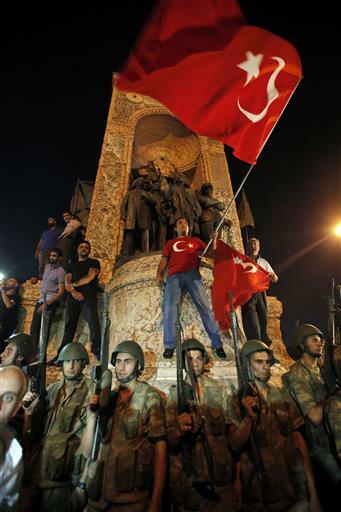 Erdogan called on the Turkish people to flood the streets in a show of support for his embattled government. Turkish broadcaster CNN-Turk says a group of soldiers have entered the headquarters of the Dogan Media group, which owns the television channel. The newscaster did not provide details on the number of soldiers who entered the building, which is also home to Kanal D television, the Dogan news agency and the Hurriyet newspaper. The newscaster said she was not sure how much longer the station would be able to broadcast news. Obama discussed the developments by telephone with Secretary of State John Kerry, who was traveling in Moscow for separate meetings with senior Russian officials on Syria. Kerry said he had stressed in a telephone call with Turkish Foreign Minister Mevlut Cavusoglu the United States’ “absolute support” for Turkey’s democratically elected, civilian government and democratic institutions. Kerry said he urged all parties to ensure the safety and well-being of diplomatic missions, personnel and civilians across Turkey. Kerry also urged U.S. citizens in Turkey to stay indoors and to be in touch with family and friends. Turkey plays a key role in the U.S.-led coalition fighting the Islamic State group. NATO’s chief has called for “full respect” for Turkey’s democratic institutions and constitution. Bob – you’ve got the gist of it. Before being elected Prime Minister in 2003, Erdogan said “Democracy is like a train; when you reach your destination, you get off.” He’s been doing exactly that for the last 10+ years. Erdogan purged the military and the government of opposition, while abusing his office to benefit himself and his cronies. After this failed coup, he’ll probably consolidate his power even more. The question is, how many of the roughly 50% of Turks who don’t support Erdogan will join the millions of other migrants already pushing into Germany, France, etc.? Turkey’s population is 75 million, compared to Germany’s 81 million and France’s 66 million, so we’re talking about A LOT of potential new migrants. yep, those crazy germans seem to have a thing for electing fanatical dictators that lead them to complete destruction. this time around it will be a fanatical leftist woman, and instead of the red army it will be an army of ferral muslims that they invited in. crazy thing, really. Germany would probably be the major destination. Turks have been migrating to Germany since the 1960s. 3.7% of the German population (almost 3 million) are ethnic Turks, so there would be political pressure within Germany to accept at least some of the Turks fleeing the Erdogan regime. Wow I am shocked beyond belief ! Bob made a comment and never blamed the Mormons for something. Absolutely amazing ! Way to go Bob ! You must of takenot your meds today !